Wouldn't shopping be so much fun if it looked like this? 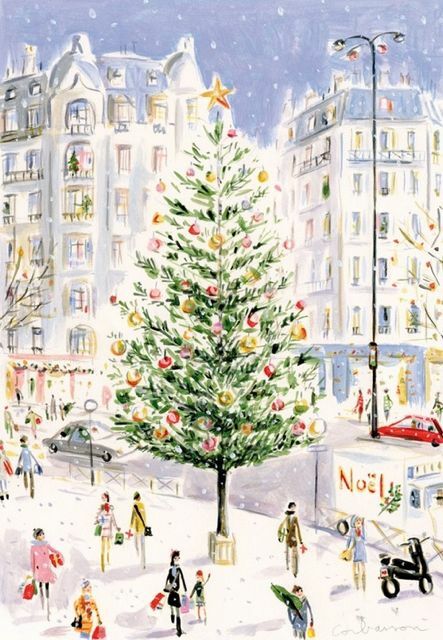 Semi crowded streets, fashionably dressed (and probably polite) fellow shoppers, a glorious tree and a Parisian backdrop. Truthfully I avoid Christmas shopping in public at all costs during the holidays but I do love a good online splurge from the comfort of my own home. I'll be clicking away today grabbing up a few goodies and I'm looking forward to enjoying the Christmas tree and a cozy fire this evening with the boys. I'll also be putting the finishing touches on a fun gift guide I've been working on for the blog. Happy Shopping!